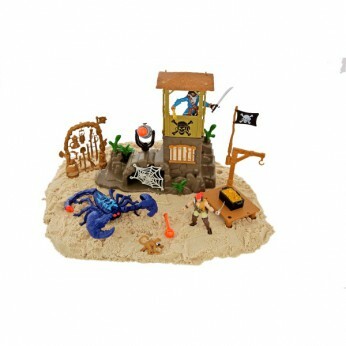 The set comes with 1 Pirate Island which can be connected to a pier that features projectile cannon. Set includes a watchtower, two pirate figures, one monkey, one treasure box and a scorpion with mechanical function are included. There is a weapon and accessories frame that contains guns, knives, tools and treasures. Styles and contents may vary…. This toy costs approximately £12.99 (for the latest and best prices make sure you check our retailer list for the Pirate Scorpion Island Playset above). In our review of Pirate Scorpion Island Playset we classed it as being suitable for ages 3 years, 4 years, 5 years but recommend you check the manufacturer specific advice before purchasing.